Easy-To-Use MLS Search. This site will give you access to all of the real estate listings in Gold River. Search the MLS for free by registering, and receive email notifications with new homes that meet your selections. To begin, use the Search Bar above to find your perfect Gold River dream home, or scroll down to see the newest homes in Gold River below. Gold River is a prestigious housing development made up of 25 separate "Villages" (distinct neighborhoods that each have a village name) that were built from 1982 to 1995. 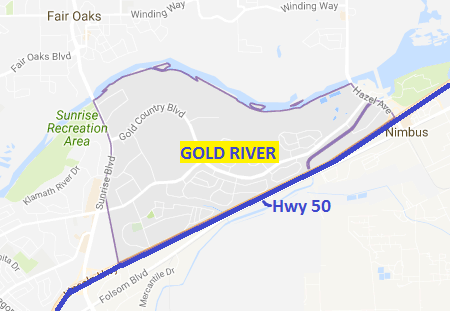 In addition to the beautiful homes & historical California village & street names, what makes Gold River special is how well integrated it is with its unique positioning along the American River. Beautifully landscaped, park-like neighborhoods, and large shady oaks echo the natural beauty of the area. Gold River has about 5 miles of nature trails that wind around the villages, and guide residents to the American River Parkway. Walking, running, bicycling, rafting, and kayaking are just a few of the pursuits that Gold River residents enjoy. Click here for a Gold River Map of Villages and Nature Trails. The location of Gold River is excellent with an easy commute to HWY 50, and two freeway access points (Sunrise Blvd & Hazel Blvd). As for shopping, the Gold River Shopping Center has: Bel Air Supermarket, Rite Aid, Starbucks, Applebees, Jack's Urban Eats, Outback, Il Forno Classico, a Wells Fargo Bank, and many other restaurants and stores. This master planned community has single family homes, townhomes, and condos. All Gold River homes are part of various home owners associations that protect property values and provide architectural controls. Some home owners associations, like those in the Coker Ewing developments have lower HOA dues, but less services are offered (like only front yard landscaping). The Powell developments tend to have higher HOA dues but offer more services (like exterior house and fence paint, street & gate maintenance, in addition to front landscaping). Gold River has one public elementary school, the "Gold River Discovery Center" that provides education from Kindergarten through Eight Grade for about 800 students, and is typically one of the highest rated schools in the area. The types and styles of Gold River homes are unique depending upon the developer. Robert C. Powell, the visionary behind the Gold River Master Plan and main developer, built homes with a unique architectural style that incorporated his love for nature. It has been said that Powell put the interests of the environment and Gold residents above those of developers. About three-quarters of all Gold River homes were built by Powell. A population of about 8,000 residents. With a median family income of over $117,000, Gold River is the highest-income place in Sacramento County (2010 census). Interested in seeing SOLD information for homes in Gold River? Listing courtesy of Re/Max Gold Rocklin. Selling Office: Berkshire Hathaway HomeServices Elite Real Estate. Listing courtesy of Re/Max Gold El Dorado Hills. Selling Office: Sadek Real Estate. Listing courtesy of Mckiernan Realty. Selling Office: Stanley Real Estate & Investment Inc.. Listing courtesy of Judy Thompson, Realtors. Selling Office: Lyon RE Fair Oaks. Listing courtesy of Re/Max Gold El Dorado Hills. Selling Office: Coldwell Banker Residential Brokerage. Listing courtesy of Suncal Real Estate Group. Selling Office: Century 21 Select Real Estate. Listing courtesy of Lyon Re Sierra Oaks. Selling Office: Lyon RE Folsom.